A great suspenseful thriller for it's time. Still holds up thanks to some iconic scenes and Mitchum's terrifically scary villain. I may prefer the remake from a story standpoint, but this original is rock solid. Robert Mitchum is so effectively chilling that goosebumps are evoked merely from our introductory glimpse at his Max Cady. Amazing. Don't even try to see the remake. This has several really scary scenes. No posts have been made on this movie yet. 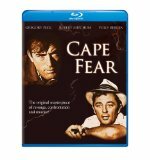 Be the first to start talking about Cape Fear!